A beautiful city full of architectural masterpieces and towering skyscrapers, Chicago is a fantastic place to visit, with a wealth of things to see and do. Located on the shores of Lake Michigan, water features prominently in the city and the delightful Chicago River runs through its many neighborhoods. 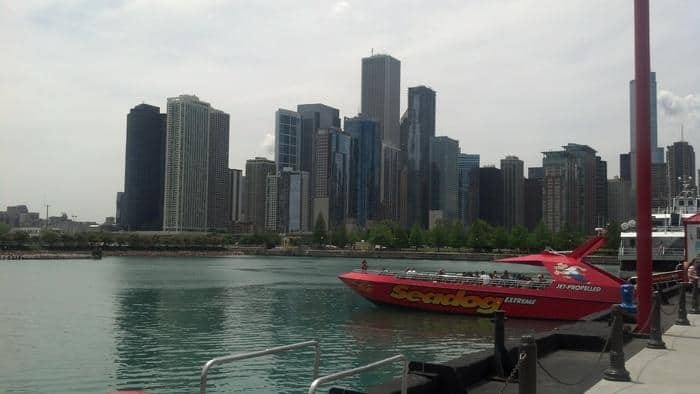 As such, a boat tour is a brilliant way to see as much of Chicago as possible. The views from Lake Michigan really need to be seen to be believed, such is the beauty on show. 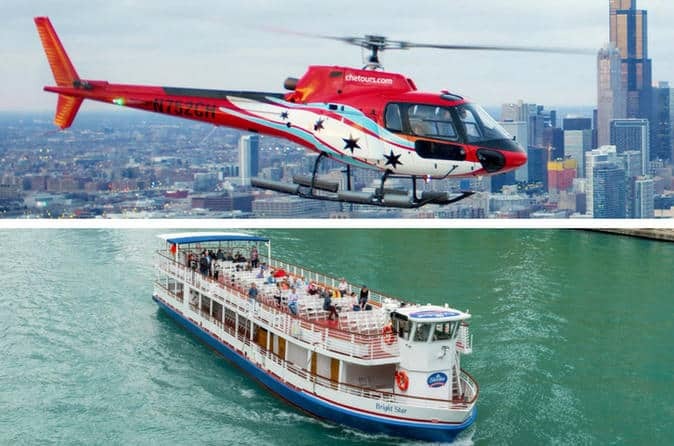 To give you an idea of what is available, here are some of the best boat tours that will entertain, astound, and inform you about all that there is to see in Chicago. This wildly popular cruise comes highly recommended by guests who have been on it, and with good reason too; it takes you past many of the city’s most famous landmarks and beautiful buildings. Sailing under the historic bridges is a memorable affair. The incredible architecture of Chicago is brought to life by the fantastic audio commentary, which gives you invaluable insight into the history of the place. 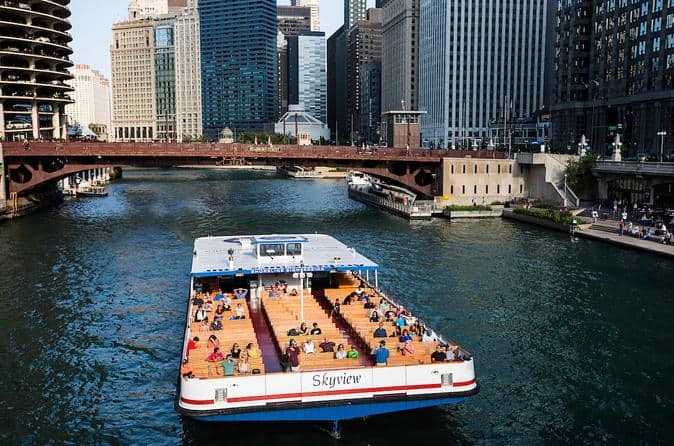 While cruising along the three branches of the river, you’ll pass more than 40 structures, with Trump Tower, the Wrigley Building, and Willis Tower among the many highlights. Slowly sailing along the Chicago River as the lights come on and dusk falls is a magical experience and the perfect way to explore Chicago by night; the views of the skyline are spectacular. With a huge buffet to choose from, the meal is sumptuous, and enjoying a drink on the deck as you look up at the stars will live long in the memory. In addition to the wonderful food and sights, DJs play a selection of hits. Dancing the night away on deck is a lovely way to end a great day out in Chicago. 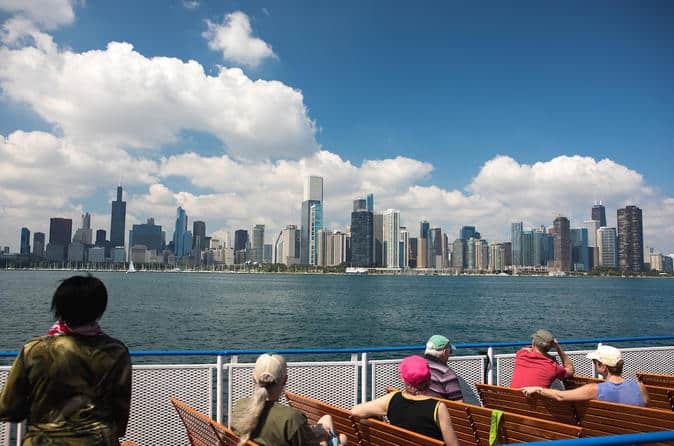 Cruising along Lake Michigan while sitting back and watching Chicago’s incredible sights pass by you is a delightful experience and a peaceful way to see a lot of the city in one go. The extensive menu means that there is something for everyone to enjoy; you certainly won’t come away feeling hungry after the meal. In addition to this, there is live entertainment for you to enjoy while you eat. The stunning skyline really needs to be seen to be believed, with the huge skyscrapers towering over the water, seemingly defying gravity as they stretch towards the heavens. This will certainly go down as one of your most memorable lunches ever. Taking you past all of the main architectural wonders in the city, this lovely cruise is well worth checking out and comes highly recommended by those who have been on it. Sailing along the Chicago River is a great way to see a lot of the city in one go. The professional guide will definitely open your eyes to the incredible feats of engineering that are on display and the stories behind the buildings themselves. With the skyscrapers towering above you, cruising along the river is a lovely way to spend an afternoon. You’ll come away impressed and astounded at all of the marvelous buildings and landmarks that you’ve seen. 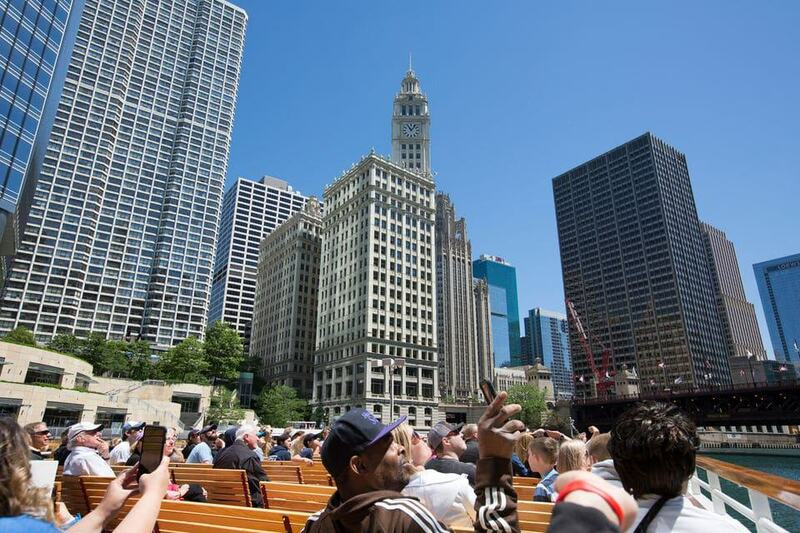 If you’re a bit pressed for time and want to see as much of Chicago as possible, this tour is the perfect option; you can watch the world go by while eating lunch. With lots of variety on offer, the food will have you salivating and the live music will keep you entertained as you tuck into your meal. The spectacular buildings on either side of the river will grab your attention and the audio commentary will point out all the main highlights that you pass by. In addition to all this, the delightful cruise also takes you to the spectacular lakefront, which offers breathtaking views of Lake Michigan. 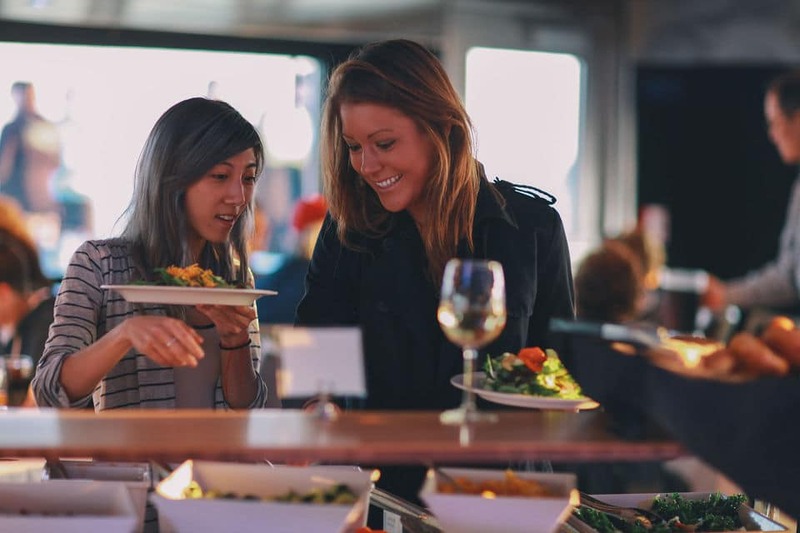 Combining dinner, dancing, and sightseeing into one incredible package, this sunset cruise will leave you awe-struck at the beauty of Chicago, as evening fades and lights come on across the city. Cruising around Lake Michigan while sitting back and relaxing is a delightful way to end the day. The buffet meal will certainly leave you content, as well the lively music that is put on for your entertainment. The views of Chicago at night will leave long lasting memories of a beautiful trip, and the sun slowly setting over the waters of the lake only adds to the beauty before you. Magical. This whirlwind tour around Chicago’s waterways is an exhilarating affair, as you explore the city’s many landmarks by speedboat, skipping over the water with the wind in your hair. With a professional guide to tell you about the impressive array of buildings before you, the city’s history and architecture come alive; you’ll certainly come away with a greater understanding of Chicago. 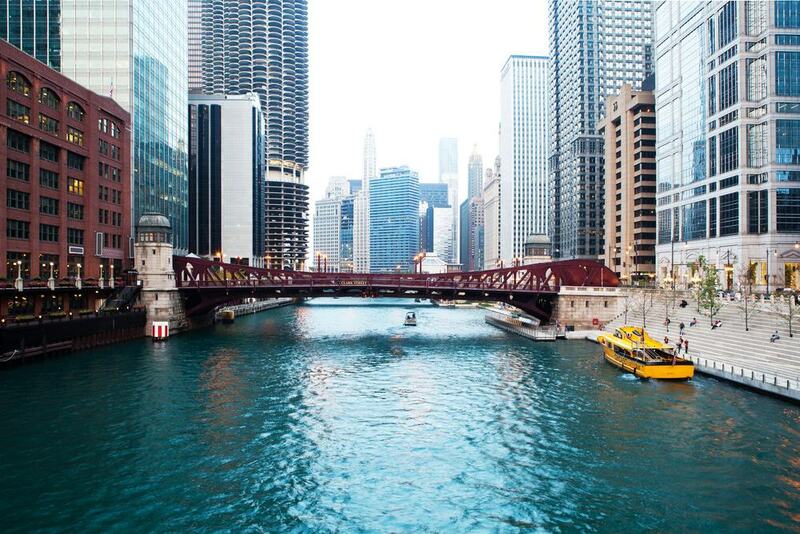 The 75-minute tour takes you along the Chicago River and around Lake Michigan. Among the many sights on show are the Willis Tower, the Lyric Opera, and the Chicago Locks. Not to be missed. 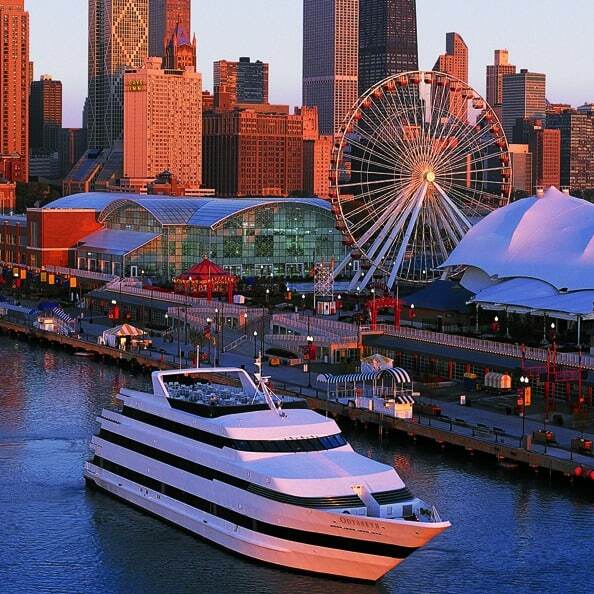 This wonderful cruise takes you all around beautiful Lake Michigan and past some of Chicago’s most stupendous sights. The city appears before you, with its towering skyscrapers looking out over the lake. With fantastic panoramas of the Windy City in front of you, time will shoot by as you are entertained and educated in equal measure by the audio commentary and the crew. Among the many sights on offer are the John Hancock Center and the Trump and Willis Towers. 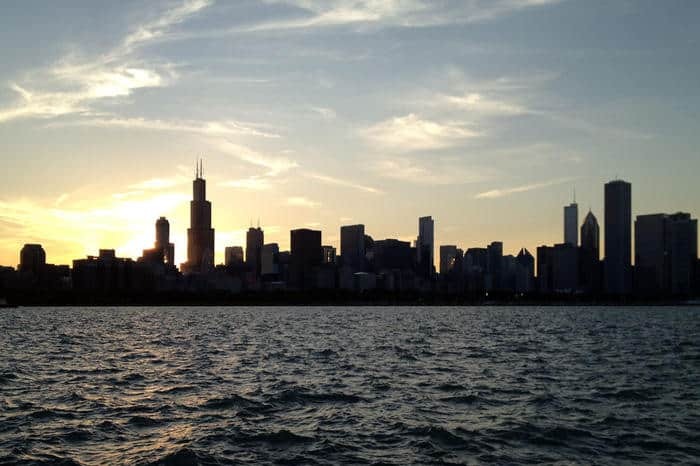 If you want to get to know as many parts of Chicago as possible, a cruise along the river is a fantastic way to see loads of the city’s landmarks in one go. The audio commentary will certainly teach you a lot. 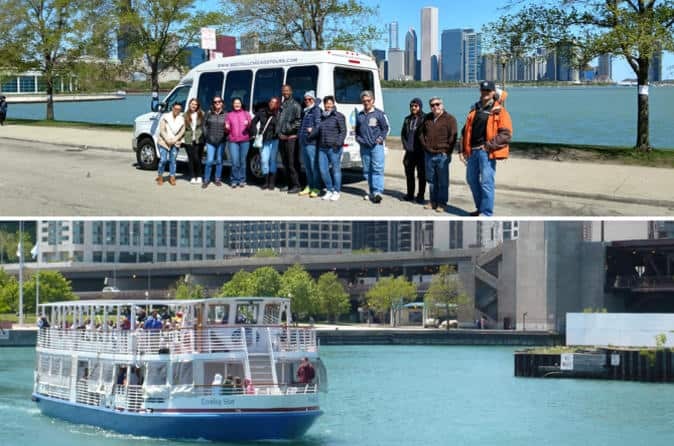 In addition to the delightful boat tour, this combo deal also includes a walking tour, which takes you around Grant Park, the Adler Planetarium, and the amazing Art Institute of Chicago, among others. With so many sides to the city to see, this tour around Chicago’s South Side is fantastic for all that it has to offer and is well worth checking out. An exhilarating affair, cruising around Chicago on a speedboat is loads of fun and visitors are sure to enjoy their tour around the city. With a wealth of things to see and do, the tour commentary will point out all the main landmarks. You’ll also get tips on what you just have to see when visiting Chicago. As interesting as it is educational and informative, this lovely cruise will live long in the memory for the spectacular sights on show and the amazing architecture you pass by. 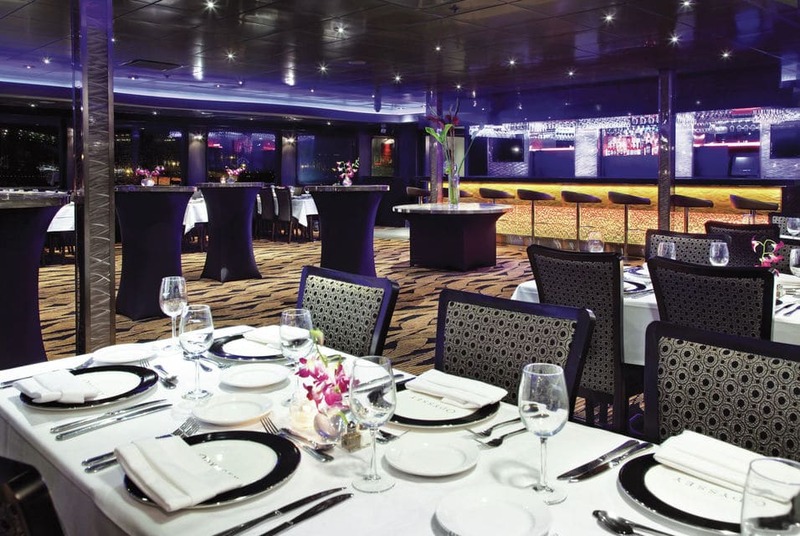 A fantastic way to spend an evening, a three-course gourmet dinner aboard the Odyssey is brilliant and the live music makes for an intoxicating fun-filled ambiance. Sailing along the river and watching the city come to life is a magical experience and the stunning skyline needs to be seen to be believed. Watching the sunset over the city is absolutely divine; you’ll wish that you could spend every evening dining on the river. 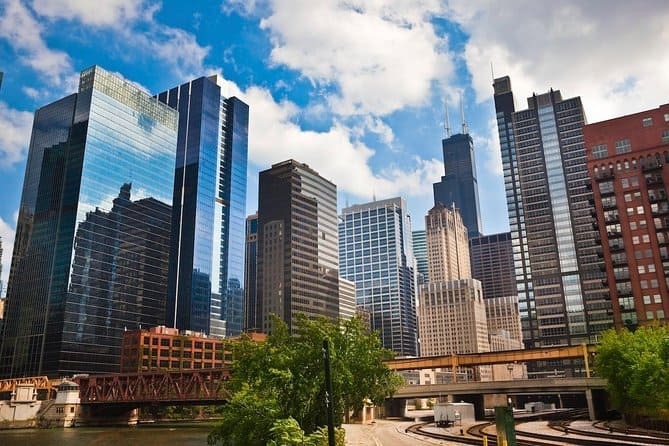 Accompanied by an expert guide, this minibus tour around the city will take you to many of Chicago’s most important landmarks, historical sights, and bustling neighborhoods. With stops at The Rookery, Millennium Park, and the Willis Tower included in the tour, you’ll come away with a deeper understanding of what makes Chicago tick. Many people opt to include the architecture river cruise in their package and it is definitely worth doing; the boat tour offers a whole new look at the city from a different angle. 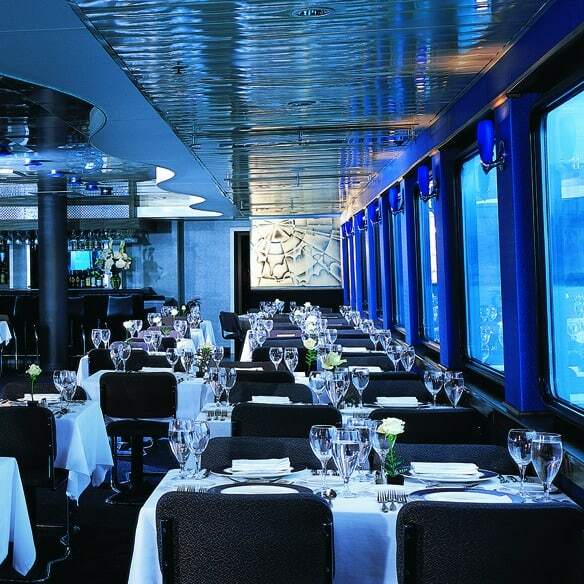 What better way to start your day than with brunch aboard the Odyssey? 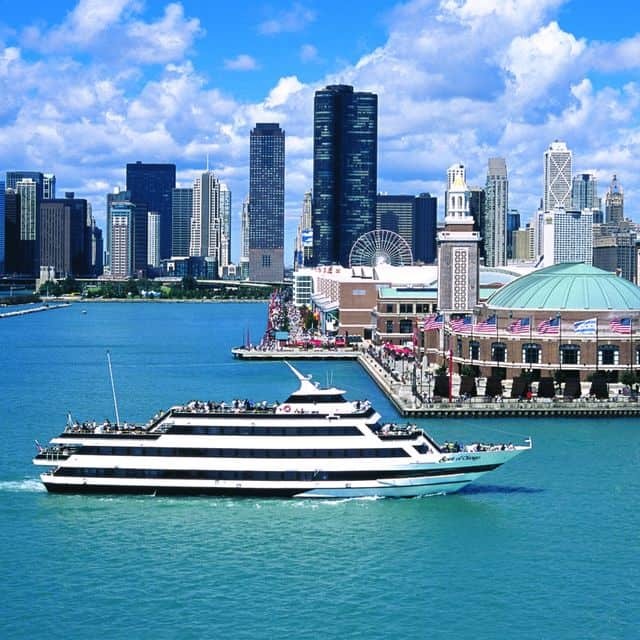 Cruising around Lake Michigan while watching Chicago before you is a delightful way to begin a busy day’s sightseeing and will enable you to see a lot of the city in comfort and style. The Chicago skyline is awe-inspiring to behold and the captivating audio commentary will teach you a lot about the buildings that you see, as well as the history of the city itself. After you have cruised along the Chicago River and taken in all the amazing architectural wonders from the ground, it’s time to take to the skies and see Chicago from above. An incredible experience, the helicopter tour will take you above many of the city’s most famous landmarks — it really is special to see them from a whole new perspective. This combo deal will delight and astound visitors, and the unparalleled views of Chicago that it presents will create lasting memories. The perfect way to see much of Chicago in one go, this whirlwind tour will take you past many of the city’s most incredible sights and historical buildings, with all of their wonderful architectural features. Wandering around the north and south shores is a great way to spend the day. Your expert guide will bring the city to life as they tell you the stories behind the places you pass. After you complete the walking tour, it’s time to take to the river and explore the city by boat. With the skyscrapers towering above you, sailing along is a relaxing experience. You are sure to come away tired but happy with all that you have seen.